Armagnac is a spirit that has to be perfectly crafted. It comes from the Armagnac Region which is located inside the province of Gascony, which is located in Southwest France (South of Bordeaux). There are also sub-regions within Armagnac, these are: Bas-Armagnac, Armagnac-Tenareze and Haut-Armagnac. This particular area for producing Armagnac has only been defined since 1909. It has an Appellation d’Origine Controlee status since 1936 which covers about 600 square miles (15,000 hectares) in the Departements of Gers, Landes and Lot-et-Garonne. A little note: in 2007, Armagnac Blanche (unaged Armagnac spirit) was officially recognized by the French authorities and brought under Armagnac’s Appellation d’Origine Contrôlée. Bas-Armagnac is a low altitude sub-region that produces well rounded, fruity and intense brandies and is located on the Western side of the region, near the coastline. About 57% of all Armagnac produced comes from this region. The soil is mainly sand and it is rich with iron and some clay. Ugni-Blanc and Baco Blanc are widely planted here. This area is considered to be the equivalent of Cognac’s Grande Champagne Region. Armagnac-Tenareze creates intense, strongly flavored brandies and is located in the Center of the region. Most Armagnacs from here will see longer aging than those from Bas-Armagnac. About 40% of all Armagnac comes from this region. The soil here consists of mainly sand, limestone and clay with many small streams running through the land. Ugni-Blanc and Colombard are the most widely planted grapes here. This is similar to Cognac’s Borderies Region. Haut-Armagnac has very small pockets of production in the Eastern side of the region. It is at a higher altitude due to the Armagnac region being at the foot of the Pyrenees Mountains and only makes up about 3 to 5% of all Armagnac produced even though it takes up almost 50% of the Armagnac Region. Most of the soil in the area is limestone, clay and chalk which produce flat and hard spirits. Ten grape varieties are allowed to be used in the production of Armagnac. Most Armagnac is made from Ugni-Blanc, Colombard, Folle Blanche and Baco Blanc. 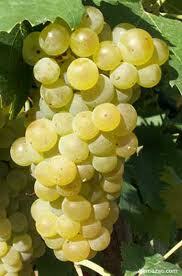 Other grapes used are Blanquette, Jurancon, Clairette de Gascogne, Plant de Graisse, Maslier Saint Francois and Mauzac. The grape vines endure harsh winters and hard blown winds from the sea and Pyrenees Mountains. 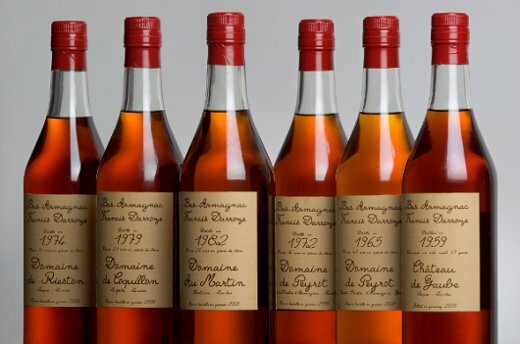 For every 1 bottle of Armagnac produced, there are 200 bottles of Cognac produced. Folle Blanche: Very fruity and floral grape that shows a lot of finesse when aged for 15 years. This was the original Armagnac grape also called “piquepoul”. The main reason why it isn’t used as much anymore is due to phylloxera killing off most of the grapes in 1893. This grape is extremely sensitive to rot. 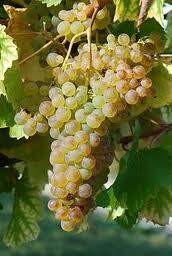 Ugni Blanc: Also known as “Trebbiano”, this grape is used to blend young Armagnacs. This is a late ripening grape that thrives in acidic soils. Baco Blanc (Baco 22A): This grape produces well rounded Armagnacs, but even better Vintage Armagnacs. 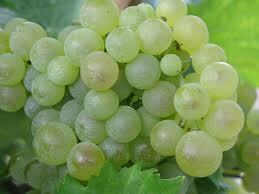 It is a hybrid created by crossing Folle Blanche and the American Noah grape and has a protective, tough skin. Monsieur Francois Baco experimented with grapes after the phylloxera plague and plotted some grapes on plot 22A, hence the name. The grape thrives in the sandy soils of Bas-Armagnac. Colombard: This grape can produce some very young Armagnacs due to the fact it can be harvested earlier than the other grapes. It imparts herbal, grassy and hay aromas to Armagnac. Grapes are usually harvested in October and are immediately pressed. Some producers use pneumatic presses, but many smaller farmers use hand turned screw presses. The juice is then fermented into a wine and held for distillation. The wine is usually acidic with a low alcohol content (9-10% ABV). No additives are allowed to be used in the production and distillation of Armagnac. The wine that is held for distillation in October, must be distilled by the end of April. Armagnac Appelation states that distillation must be completed no later than March 31st. The wine will either be distilled in the vineyards cellar, but sometimes by roving distillers who own a small Alembic pot still on wheels. The wine will be distilled once in a copper Alambic Armagnacais (continuous still), as where Cognac is double distilled. Armagnac is distilled at a low strength usually 52-60% ABV, where Cognac is usually distilled around 70% ABV. As the wine travels up the plates (usually 7-9 plates) in the still, the wine will start to evaporate. As some of the vapors collect on the plates, they will turn back into wine, contacting more wine vapors on the way down. This specific feature helps the Armagnac to pick up some fruity elements. Once the vapors reach the top of the still and start the travel down the coils, it will turn into Eaux de Vie. About 95% Armagnac is distilled in this traditional manner, but there are a few producers who do things differently. Since 1972 Arab’s Head pot stills (used in Cognac) have been used, mainly to produce double distilled Armagnac with a 70-72% ABV content like Cognac. The main reason why this is used is due to the fact that a double distilled product will age more rapidly, so the producer can bottle and sell the product faster. 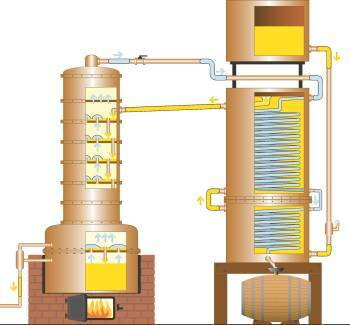 A new law introduced recently will require that all distilleries operating with double distillation will be required to have a continuous Alambic Armagnacais still on their property by 2019. The Eaux de Vie will come off the still colorless and will then be aged for a certain amount of years in 400 liter black oak casks from Monlezum wood. Limousin, Gascon and Troncais French oak are also widely used. Many of the characterisitics of the Armagnac will pick up flavors from the wood (vanilla, prunes, candied fruit). Most Maitre de Chai (Cellar Masters) will age their fresh distillate in new oak casks, usually for the first 6 months in first fill casks and up to 2 years in second fill casks. Over time the aging spirit will be pumped into older casks to reduce the extraction of tannins from the oak. When the spirit is pumped from cask to cask, the aeration actually helps the aging Armagnac to gain more flavor. The Armagnac will pull tannins, vanillins and spice flavors and aromas from the oak. Most cellars are made from thick stone walls and earth floors to maintain a constant cool temperature and high moisture. This will lessen the chance of yearly evaporation, which also allows for longer aged Armagnac. Average evaporation is about 0.5-3% a year. Armagnacs that have been aged for 50 years or more will usually be moved to glass containers (called dame jeannes) to stop the aging process so they will not over extract oak flavors and lose any of its alcoholic strength. The single distillation helps the Armagnac to retain flavors from the original wine. They’re full bodied, rich, complex, fruity and retain the Terroir where the grapes originally came from. Armagnac’s are either single vintage or a blend of various ages. Some cellar masters will blend their Armagnac of different ages and varieties to create a consistent Armagnac. This is called “coupage” and will involve the addition of distilled water or “petites eau” to lower the alcohol content to bottling strength which is a minimum of 40% ABV. The age on the bottles refer to the youngest Armagnac in the blend. If there is a term “Hors-D’Age” on the label, this means that the spirit in the bottle has been aged for at least 10 years in oak barrels. If there is a vintage year mentioned on a label, this is the year the grapes were harvested. Blanche Armagnac: An Unaged Armagnac (less than 1% of total production). V.S., 3 Star: Must be aged at least one year and two years if it is to be exported. X.O., Napoleon: Must be at least 6 years old. Hors d’Age: Must be 10 years or older. Vintage: Refers to the stated year of distillation (year the grapes were picked and pressed). They are usually bottled at their cask strength, typically between 40-48% ABV. Single Cepage (Single grape variety): This refers to the Armagnac in the bottle being made from only one type grape. The Darroze family has been making Armagnac for 3 generations. In the 1950’s and 1960’s Jean Darroze ran a restaurant in Bas-Armagnac and wanted to share his love for food and wine with his family and the world. Francis Darroze was in charge of the wine and Armagnac list in the family run restaurant. Francis would visit different vineyards and would collect Eaux de Vies from them. In the 1973 he decided to start aging them himself in his own cellar. He scoured the countryside to find the best barrels to age his hand picked spirits in. Currently his son Marc Darroze has helped him to take on the selection and aging process. In over 30 years they have created over 250 Armagnacs from 30 small domaines including more than 50 vintages. Every bottle contains the Domaine of Origin and the vintage. Darroze makes up only 15% of all Armagnac sold in the world. Darroze is close to the Piranese Mountains and the ocean. These two factors play a huge role in how their grapes are influenced. The local soil is iron rich which helps to create robust grapes for Armagnac distillation. All of the Armagnac’s are single distilled to keep character and flavor of the specific vineyard it comes from. All of their bottlings come in at cask strength meaning there is no water added to the final product. Marc Darroze likes to mainly use 3 grapes in the production of his Armagnacs. They are Ugni-Blanc (makes up about 50% of all Armagnac), Baco Blanc (a hybrid) and Folle Blanche. One of the main reasons Ugni-Blanc is used so much is due to the fact that it ages at a much more rapid pace than all of the other grapes used in production. Baco Blanc usually takes the longest to age and create a full bodied Armagnacs. Average aging is about 12 to 15 years, but the resulting Armagnacs are very unique. Folle Blanche represents about 5% of all Armagnac made. It is the oldest grape grown in this region and it usually grows best in sandy soils. Once the grapes have been pressed for their juice, it will be fermented for 2 weeks. Three to Elleven weeks after fermentation, distillation will begin. Darroze likes to distill the lees into the Armagnac to add even more flavor and character to their spirits. The Armagnac (like all Armagnac) will be single distilled, which will keep the alcohol content lower. This helps to keep the character and flavor of the grapes and the soil. After distillation, Marc will take the Eaux de Vie and place it into 400 liter local French oak barrels. The aging process will create a more rustic and elegant spirit. The Armagnac will be put into casks at about 53% ABV. There are two factors affecting proof of a spirit. Humid environments will evaporatr alcohol, hence a drop in proof. Dry environments will evaporate water, that’s why in certain vintages you will see the alcohol proof rise on the label. Different wood will be used to age different types of Armagnac. Larger grained wood will help to speed up the aging process, due to the fact that the grains will pull more of the spirit into the wood. Most of Marc’s Armagnac will see 2-5 years in new oak and then be transferred to another cask (this is to prevent tannins from altering the spirit). The Armagnac will evaporate at about 3% a year. Armagnac made from grapes grown in Bas-Armagnac. Grapes in this blend are Baco Blanc (about 40%), Folle Blanche and Ugni Blanc. The vintages range from 10-20 years. Nose: Sweet caramel and spicy oak. Palate: Rich, full bodied, intense, candied fruit, spicy oak. This 1996 vintage is aged in a new French oak cask for 11 years before being removed and bottled at cask strength in Loquefort, Landes. The grapes come from Domaine de Dupont in Bas Armagnac in the village of Mauleon d’Armagnac. 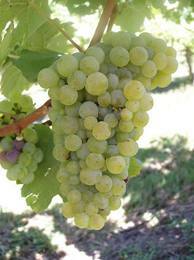 They are grown in tawny colored, sandy soil which the Ugni Blanc grapes thrive in. The grape used in this 1985 bottling are 100 % Baco Blanc and come from the Bas Armagnac region in the village of Creon d’Armagnac. The grape in this bottling is 100% Baco Blanc. They are grown in the Bas Armagnac region in the village of La Houga. Made in the Bas Armagnace region in the village of Hontanx. The soil here mainly consists of sand and houses grapes like Baco Blanc, Colombard, Folle Blanche and Ugni Blanc. Most of the Baco Blanc grapevines are 50 years old and the Colombard and Ugni Blanc (St. Emillion) are about 20 years old. The grapes in the vintage are 65% Baco Blanc, 25% Ugni Blanc and 10% Folle Blanche. Nose: Pear and apple blossom, espresso, lemon peel, apricots and chocolate. Palate: Bing cherries, coffee, raspberries, baking spices, candied red apple, caramel corn, oily. Finish: Long, oaky, toffee, spicy finish. This particular vintage is made in the Bas Armagnac region of Gascony in the village of Hontanx. Baco Blanc, Ugni Blanc, Colombard and Folle Blanche grapes dominate this region. They are grown in sandy soils on some very old vines. This vintage bottling of Armagnac was made in the Bas Armagnac region of Gascony in the village of Le Houga. 100% Baco Blanc grapes are planted in this area in sandy soils. This vintage bottling of Armagnac is made in the Bas Armagnac region of Gascony in the village of Le Freche. Baco Blanc and Ugni Blanc are to two grapes that are mainly planted here. Nose: Big bouquet, baked pears, nutty, tobacco and vanilla. Palate: Medium bodied, semisweet,light tannins, black pepper, resin, spicy oak and off dry. Finish: Lightly sweet, sandalwood and lingering spice. This vintage bottling of Armagnac is made in the Bas Armagnac region of Gascony in the village of Perquie. This village grows 100% Baco Blanc grapes for their Armagnac. This bottling is a 50 year old Armagnac. Nose: Dried apricots, prunes, green apple, leather and a musty wood aroma. Palate: Rich dried fruits, more apricot, coffee bean, vanilla maple, butterscotch, honey. This mark of Armagnac is mostly made from Baco Blanc grapes grown in the village of Maignan-Eauze in the Bas-Armagnac region of Gascony. The vines are planted in iron rich sandy soils which help to create world famous Armagnacs. The Armagnac will be distilled once in copper column stills and will then be put into 400 liter French oak casks that have been used to age other brandies. This helps to pull less tannins out of the oak and into the Armagnac. Spirits will be blended and will oxidize more in the process, releasing more aromatic flavors into the final spirit. The final result is a blend of Armagnacs ranging from 18-22 years. Nose: Prune, black berry, peach, vanilla and black walnut. Finish: Lengthy, oak and spice. Armagnacs from this distiller and grower come from the Bas-Armagnac region of Gascony. This particular Armagnac house grows grapes like Colombard, Folle Blanche and Baco Blanc. They usually only distill the Colombard to make their Armagnacs. The different varietals will be distilled to 52% ABV and then transferred to the 10 casks they hold on site. The brandy will be aged for 2-3 years in new casks and then transferred to older casks to prevent tannins from altering the flavor. Casks will also be opened or “aired” once a year to help introduce more aromatics into the Armagnac. Chateau Briat is known to create an Assemblage of the varieties at a minimum of 4 years and sometimes up to 10 years. This particular Armagnac comes from the Domaine de Ravignan in the Bas-Armagnac region in Gascony. Grapes are grown in sand and limestone soils on property. The brandy will be distilled to 52% ABV before being put into casks. 5 to 7 liters of wine will result in 1 liter of Armagnac after distillation. All of their Armagnacs will spend a minimum of 12 years in French Limousin oak casks before being bottled. This Armagnac is made from about 80% Baco Blanc grapes. Palate: Smooth, soft, rich fruit, cinnamon, all spice, oak, very rum like. Finish: Polished, well rounded, toasted almond. This particular Armagnac has been aged for 28 years before being bottled. This Armagnac is made from 100% Ugni Blanc grapes (the only Armagnac that does this) grown in the Bas-Armagnac region of Gascony. All of the aging has been done in new French Limousin oak casks. 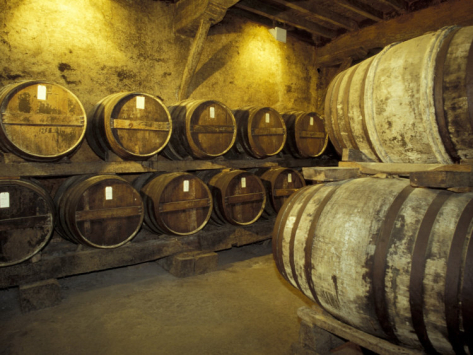 The casks are not the traditional 400 liter cask, instead they are a 265 liter cask, similar to what Cognac is aged in. It is a blend of other vintage Armagnacs from 1962, 1968, 1977 and 1978 and will be blended before being taken on its “Tour du Monde”. One of the interesting things about this Armagnac is that it takes a “Tour du Monde” or a “Trip Around the World” in their barrels. The voyage will usually last around 90-110 days. The rocking of the ship allows the Armagnac to make contact with the entire surface area of the barrel as well as speed up the aging process. The casks will be aerated 3 times a year which will result in a 1-1.5% evaporation a year. Nose: Vanilla, nutmeg, lemon peel, raisins, toffee. Palate: Light wood tannins, rich concentrated fruit, butterscotch, marzipan, white raisins. Finish: Well rounded, soft, honey. The grapes that are grown to make this Armagnac are produced at the Chateau de Rieutort in the Bas-Armagnac region of Gascony. The grapevines are grown in soil that consists of sand and some light clay to give the final spirit its delicate flavor. Folle Blanche, Ugni Blanc, Colombard and Baco Blanc make up most of Da Montal’s Armagnacs. Once the Armagnac has been distilled it will go into 400 liter French oak vats taken from the Monlezun and Freche forests. This mark of Armagnac comes from the small Commune of Le Freche in Bas-Armagnac, which is located in Gascony. They mainly grow Folle Blanche, Ugni Blanc and Colombard in the iron rich sandy soil of this region. This particular release is made from 100% Folle Blanch grapes. The grapes will be pressed and then fermented and distlled as soon as possible, usually by November. The Eaux de Vie will be put into new, 420 liter French oak casks taken from the Gascon forest. 50% of the new distillate spends 12 months in new casks, while the other 50% spends time in casks previously used. Palate: Orange peel, black pepper, cloves, toffee. The name Marie Duffau actually comes from Prosper Delord’s wife whom he married in 1925. They would travel around with a copper still and distill grapes from various villages and sell it. Their grapes are grown in the Bas-Armagnac region of Gascony in the iron rich sand soils. The Delord family will grow their own Ugni Blanc and Colombard grapes, but they purchase the Baco Blanc and Folle Blanche grapes from other villages. Their spirits are made from Ugni Blanc (70%), Folle Blanche (5%), Baco Blanc (20%) and Colombard (5%) grapes. This is how their Armagnacs age and blend so well to create some amazing final products. This particular mark is aged a minimum of 15 years in French oak casks that come from the Limousin and Gascon forests. Nose: Vanilla, figs, marzipan, prune cake, resin. Finish: Bitter sweet, dates and figs. This is an Armagnac that has been aged in Limousin and Gascon French oak barrels for 30 years before being bottled. It is bottled at cask strength. Nos : Baked pear, toasted almonds, parafin wax, linseed oil, salted butter, toffee. Palate: Semisweet, black tea, honey, brown sugar, oak. Finish : Candied fruit, honey, nutty.